Against the Mets today, pitcher Vance Worley looked less like the “Vanimal” and more like a sad puppy. He allowed 4 runs on 8 hits and 4 walks over six innings. Worley’s usual bite was tamed today. But what is worse than a sad puppy on the mound? Sad pandas in the batter’s box. They are adorable and you want to love them, but ultimately, they will rip your heart out. 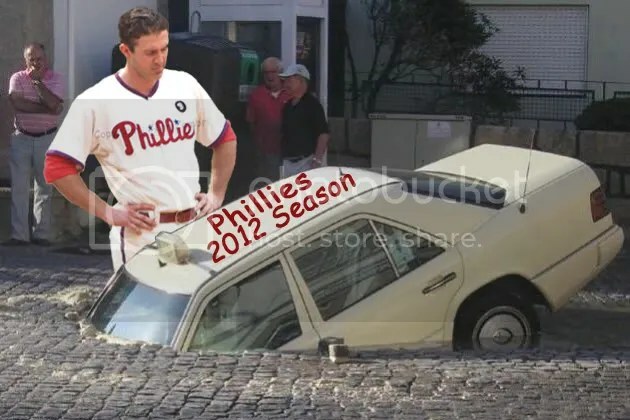 Introducing… the Phillies pathetic offense. They did Worley no favors today. 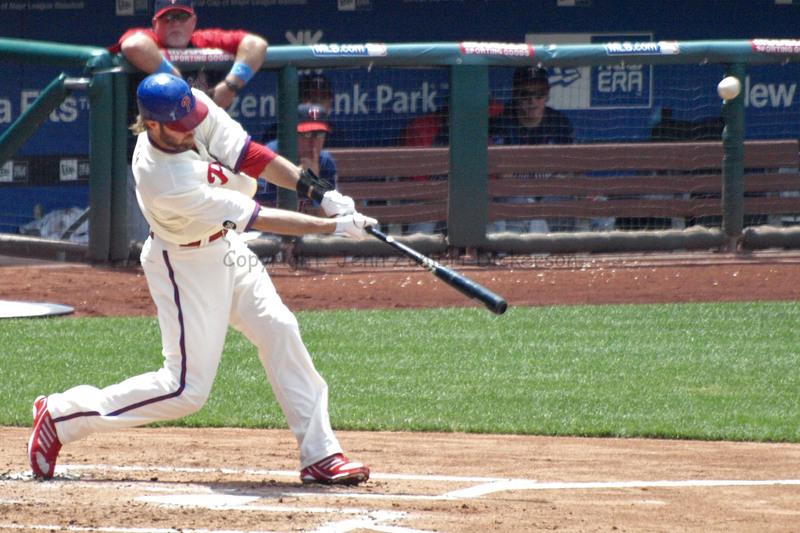 Despite having the lead-off runner reach base in three innings, the Phillies were still unable to score. And all 6 hits they collected were singles. Obviously, the Phillies have gotten off to some bad starts in the past. But this year, only 8 games old, seems somehow more alarming. Maybe it is because there is more on the line. They have the largest payroll in team history, the best pitching they could possibly have and this is the result so far? Ouch. Cross your fingers that they can salvage a win tomorrow before going on the road. Game time is 1:35pm and I will return with photos. 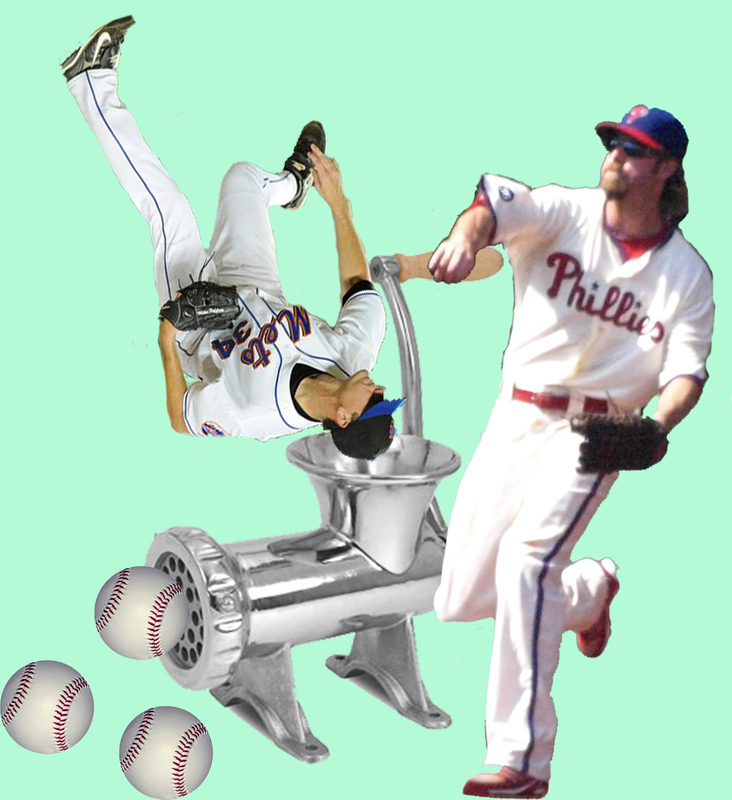 Over the last several years, manufacturing runs and playing small ball has not been the Phillies forte. Predominantly a power hitting line-up, they are suffering from a major power outage with both Ryan Howard and Chase Utley on the DL. But a little small ball tonight helped them crank out some runs to beat the Mets. In the 3rd inning, Jimmy Rollins singled and then stole both second and third bases with 2 outs in the inning. Shane Victorino doubled to drive Rollins home for their first run of the game. It was Victorino again in the 5th who singled with two outs and stole second. Placido Polanco singled to send Victorino home. 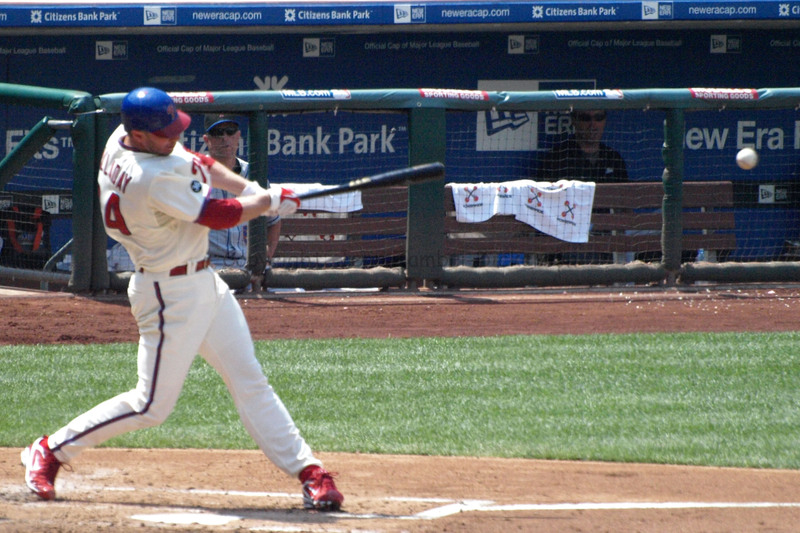 Then in the 6th, Jayson Werth led off with a triple and Carlos Ruiz singled him in. 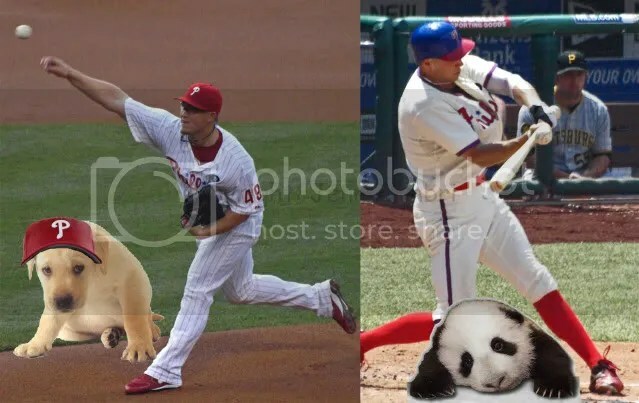 Both Werth and Victorino had a multiple hit night; 2 for Werth and 3 for Victorino. Polanco was hit by a pitch in the hand early in the game but kept playing. Nothing else was said about it so hopefully, he is fine. Although, at the time, it looked painful. Kyle Kendrick started the game for the Phils and went 6 2/3 innings allowing just one run; it was a home run from Jose Reyes. Kendrick walked only one batter and struck out 4. His last time out, Kendrick allowed 5 runs in only 3 1/3 innings, so this was a great improvement. With a 3-1 lead, Ryan Madson pitched the 8th without allowing a run. And then Brad Lidge, who has never blown a save against the Mets in his career, came in for the 9th. Lidge kept that streak alive by retiring the Mets in order. The Phillies are now tied for the Wild Card lead and 2 games behind the Braves in the NL East. In injury news, it appears that Utley may be back with the team as early as Tuesday after having surgery on his thumb for a torn ligament on July 1. He is already playing in rehab games in Clearwater. If Utley does return that soon, we can officially dub him Superman. Either that, or World’s Fastest Healer. Howard may also be back around the same time. That will be a huge boost for the Phillies! For the second consecutive night, the first hit of the game for the Phillies came off the bat of the starting pitcher. Unlike last night, that hit by Roy Halladay was not the only hit of the night. 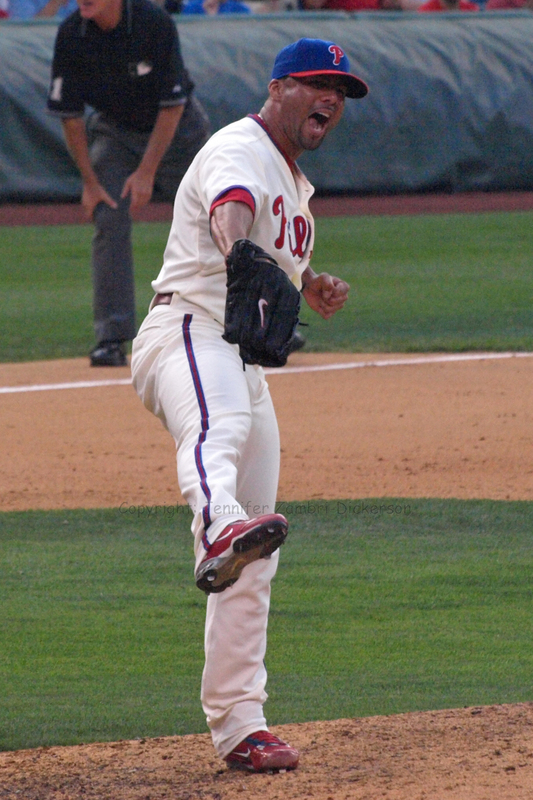 Singles by Jimmy Rollins and then Placido Polanco scored Halladay, marking the first run in 38 2/3 innings for the Phillies at Citi Field in NY. Halladay was on fire tonight. His dominance was very evident in the 4th inning when, after allowing a lead-off triple to Jose Reyes, Halladay buckled down and got the next 3 batters out without allowing Reyes to score. Halladay went 8 innings, allowing only 4 hits, no walks and he struck out 7. 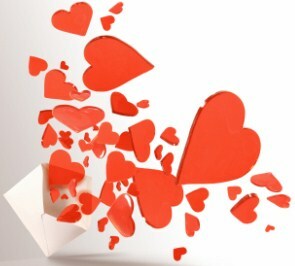 I would like to express my sincere gratitude for your efforts tonight. Those three errors and three unearned runs for the Phillies truly exceeded my expectations. Watching an easy grounder dribble through the legs of All-Star third baseman David Wright was inspiring. I nearly shed a happy tear. Though you may sometimes feel underappreciated, do not fret. We, the Phillies fans, are very thankful for your hard work and dedication to mediocrity. And if you can repeat the same performance tomorrow night as well, I promise to be your best friend…for at least one day. Don’t you feel all warm and fuzzy inside now? I know I do. So last night the Mets shut out the Phillies; tonight, the Phillies returned the favor with a 4-0 win behind the arm of Halladay. The final game of this series with the Mets is tomorrow night at 8:05pm. 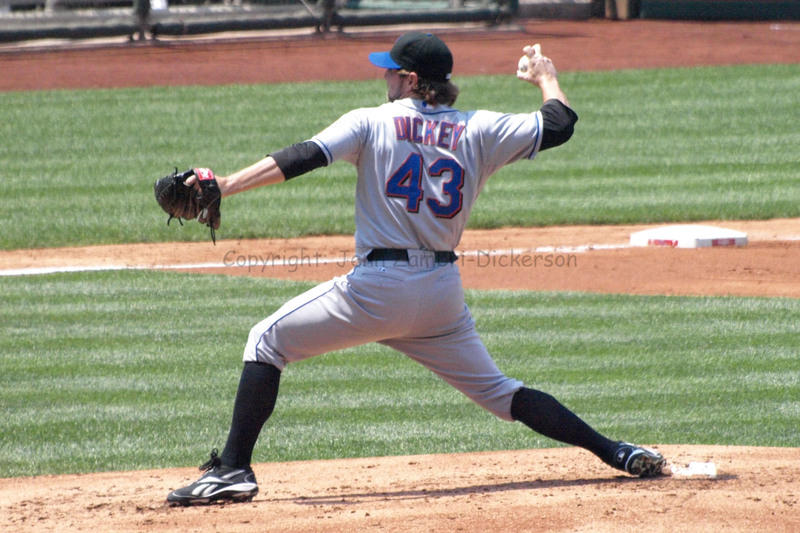 Last Sunday, the Phillies handled the Mets knuckleballer, RA Dickey, scoring 4 runs. 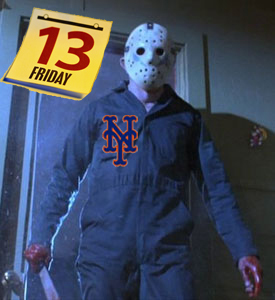 But tonight, Friday the 13th, the Phillies went hitless through 5 innings. Phillies pitcher Cole Hamels had to break up the no-hitter himself in the 6th inning with a single, since none of his teammates were helping out. Hamels certainly had a very strange night. In the 4th inning, he was hit in the leg with a line drive but appears to be okay. The next inning, Mike Hessman hit a long fly ball to left field that was called a home run. Raul Ibanez jumped up and down trying to signal to the umpire that a fan reached over the wall and interfered. Upon review, the homer was retracted but Hessman was awarded third base. This is guy who does not run well and the ball dropped close to Ibanez. How exactly the ump determined he would have had a triple is beyond me. But it did not matter anyway; Hamels struck out the next 2 batters and got Dickey to ground out to end the inning. So the Mets left a runner on third with no outs thanks to the effort by Hamels. Then in the 6th inning, Hamels had two quick outs when David Wright hit a long fly ball to center. Shane Victorino misjudged the ball and it bounced over his head for a double. The inning should have been over; instead, the Mets scored a run after Carlos Beltran doubled next. Through 8 innings, Hamels only allowed that one run while striking out 8 batters. He was spectacular. The offense, on the other hand, was not so spectacular. By the 8th, they still had only ONE hit off Dickey; the single by Hamels. This poor guy has gotten NO support from the offense all year long. The 9th inning was no different; Dickey pitched a one hit shut-out with the only hit allowed coming from the opposing pitcher. The Phillies are now scoreless at Citi Field for 36 straight innings. It was also their 10th time being shut-out this year. Disgusting. The Phillies will attempt to score a run again tomorrow; game time is 7:10pm. The Phillies reclaimed their spot in first place last night after an 11-5 win over the Mets. Let us begin with the Tale of Two Teams: Before the game, people like Ryan Howard and Shane Victorino had their game faces on. Jimmy Rollins, still on the DL, was relaxed and posing for me and Jose Reyes was busy fixing his hair. A foretelling of things to come perhaps? As for the game itself, most of it can be summed up in two innings. In the first inning, things did not look good for pitcher Jamie Moyer and the Phillies. Moyer got the first two outs but after allowing a few singles and then a home run to David Wright, he was in a big hole quickly. But the bottom of the 4th inning blew the game wide open for the Phillies. The Mets ace, Johan Santana, had been mowing down Phillies batters, except for solo homers from Polanco and Howard in the 1st. After a Chase Utley double, Santana got the next two batters out, but things then spun wildly out of control. Raul Ibanez singled to score Utley and Carlos Ruiz walked after that. The bases were loaded with 2 outs for the pitcher, Moyer. You had to imagine Moyer would just make the last out and that would be that. But once Moyer ran the count 2-0, the crowd exploded with anticipation of what might happen next. On their feet and screaming, “Johan! 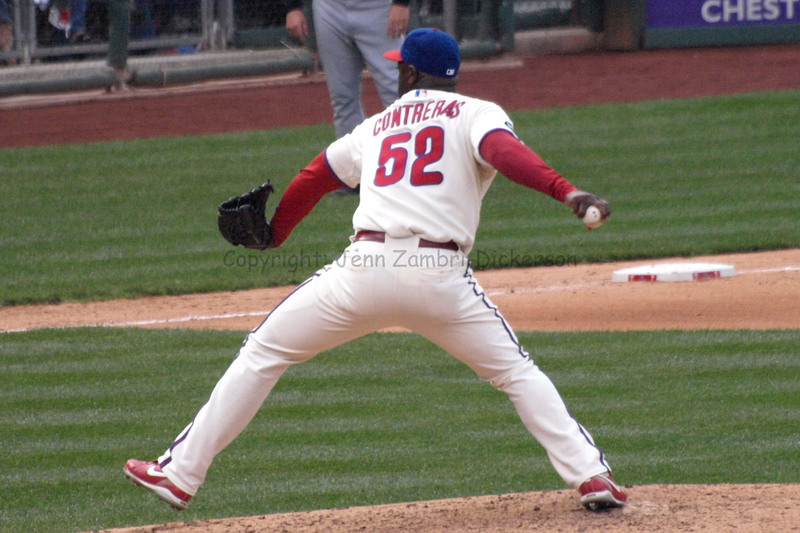 Johan!” the fans rattled Santana and Moyer, will amazing discipline at the plate, drew the walk to force in a run. Everyone began having flashbacks to Game 2 of the 2008 NLDS when Brett Myers and the crowd did the exact same thing to pitcher CC Sabathia. And who should step to the plate but the same hero from that NLDS game, Shane Victorino. But the inning did not end there. Polanco singled and then Utley homered; and with that, Santana was finally run out of the game. The Mets bullpen gave up one more run after that making it a grand total of 9 runs in the inning. Santana was responsible for 8 of those, which is more runs that he gave up in the entire month of April. And the 10 runs total marks the most runs ever allowed by Santana in a single game for his career. The Phillies batted around plus 4 in the inning and the outburst seemed to give Moyer new life on the mound. He pitched two scoreless innings after that and even got a hit in the 5th inning. Chad Durbin pitched the 7th and 8th innings without allowing a hit and Danys Baez, feeling comfy with a 6-run lead, closed out the game. Here is the full Photo Album from the game. Tonight, the Phillies will begin a new series against the Cardinals with Joe Blanton finally returning from the DL. Game time is 7:05pm. Best of luck to Blanton in his season debut!